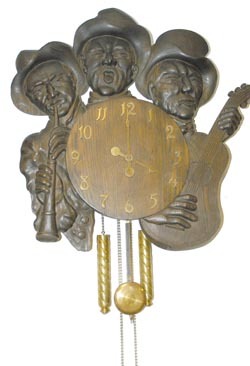 Waterbury Clock Co. rare and unusual carved wall clock called, "The Music Men", C. around 1920. One musician is playing a horn, another playing a guitar, and the middle fellow is singing. This was no doubt a limited edition with very few produced. They are very seldom seen for sale as the collectors have them stashed away. We have seen a couple of "The Music Men", and a couple of the one called, "The Pilgrims". It has two carved pilgrims with hats, and a blunderbuss gun. They were all made in a mission motif with brass numerals, hands, pendulum, and Waterbury's brass twisted weights. The dark oak case is 27" wide, 34" high. It is a big and heavy clock and the figures are carved almost life size, very detailed carving. The last sale we know of was about 6-8 years ago. It was one of "The Pilgrims", in bad condition, without twisted weights, and sold for $2500. Our estimate .